I know it's been a while since I've mentioned Microsoft Paint, but the fact is I've been secretly honing my skills so that now I can safely say I am the foremost Microsoft Paint artist in the world. 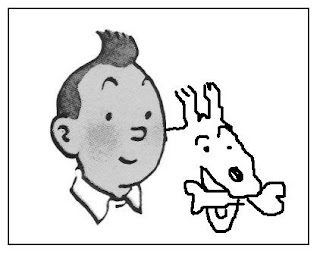 Just to give you an example, I am so good that there's NO way you can tell which of these is the original TinTin sketch and which has been re-produced by myself using MS Paint. If you want to try and decide which is the original, go ahead, but you will invariably fail! Ahaha!